“The vertical expression of a horizontal desire,” is how Angela Rippon has described the Tango, and while a trifle risqué it neatly encapsulates the essence of the music with its sensuous rhythms and beguiling beat. 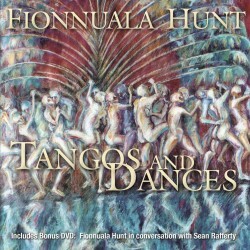 The Tango captured the imagination of one of Ireland’s finest fiddlers, Fionnuala Hunt, and this disc – the culmination of years of her own research – tracks the art form from its origins in the bordellos and back streets of Buenos Aires to the concert platforms of the world. Tangos & Dances charts the history of Tango through the 1900s up to the present day, from its early dance form to the more jazz-inspired music of contemporary times. One of Ireland’s most distinguished musicians with an impressive international itinerary to her credit, Fionnuala Hunt leads the RTE National Orchestra in her own lush arrangements of a dozen exotic dances. Complementing the CD is a bonus DVD of Fionnuala in conversation with genial BBC personality Sean Rafferty, discussing her own passion for the dance and the development of this project.